A resident of Ashdod on Sunday may have saved many lives – when he found an unexploded rocket on the roof of his apartment building. During the five days of Operation Pillar of Defense, hundreds of rockets have been fired at Israel by Gaza Arab terrorists. The Iron Dome missile interception system has had an excellent record so far of intercepting Hamas rockets that are aimed at residential areas. Iron Dome has gotten most of those, but not all. One of those rockets that was missed apparently failed to explode – and lay on the roof of an apartment building in Ashdod for at least a day. On Sunday morning, a resident of the building in the largely Hassidic Rova Zayin (seventh district) neighborhood of Ashdod went up to the roof of the building – and was shocked to see the unexploded rocket. The man, a Gerrer Hassid, immediately called police and rescue forces, who arrived within minutes. 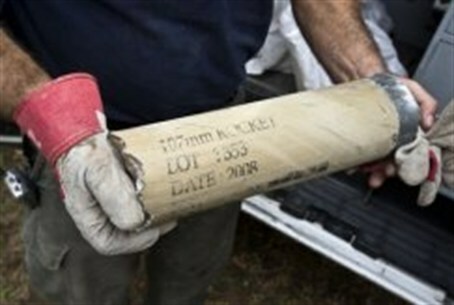 Among the forces were bomb squad experts, who were to defuse the rocket. However, defusing it proved to be difficult; apparently, the rocket had become fused with the tar on the roof, and defusing it would have required excessively moving it, which could have caused the missile to explode. As of Sunday night, experts were still working on defusing the missile. Residents of the building have been evacuated, and dozens of sandbags have been brought up to the roof in order to absorb the shock of an explosion, if one should take place.